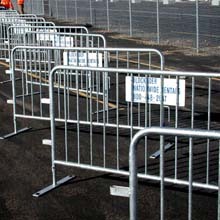 These light weight interlocking steel barriers are designed to discourage pedestrians from accessing restricted areas, provide excellent crowd control and event demarcation. Each panel is constructed of round stock steel using saddle cut welds for major joints. After assembly and welding, the panel is dipped into molten zinc which is allowed to coat both the inside and outside of the framing as well as all welded-on component pieces. This finishing process prevents rusting from within, as well as external rusting, and provides a durable, extended life cycle. Each barrier section includes a signage plate with round bottom rod welded on that becomes a carrying handle. Placed at the midpoint of the barrier section, the handle allows you to carry the barrier in a balanced position rather than having one end drag behind you.